This extensive Burma golf package is the perfect way to see many different parts of this unique country. Play golf, relax by the beach and soak up the local culture. 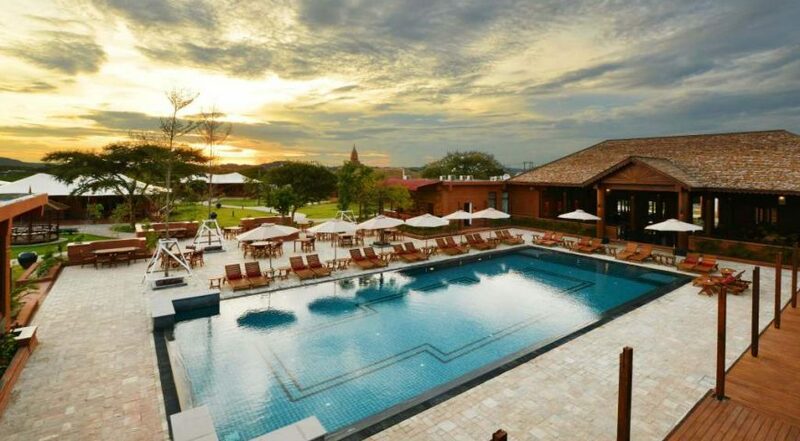 Play golf at Myanmar’s top golf course Pun Hlaing Golf Resort and play the 9-hole overlooking the ocean at Ngapali. Arrival at Mandalay International airport. Upon arrival at the airport, please proceed to the outer arrival hall to meet our airport representative who will be waiting with hand-sign holding your name on it.Transfer to your hotel. Transfer to Myotha National Golf course for your first game including caddie and shared cart. After game, we transfer to your hotel for accommodation. The embarkation time is at 12 noon at Gawein jetty. Welcome Cocktail in the Saloon.Upstream to Mingun, Cast off time is at 12:30 hrs. Lunch will be served at 13.00. The sailing time is about 2 hrs. Our English speaking manager (or your private guide) will assist the guests during the visit of the Mingun Pagoda Complex. Moor Overnight at a sandbank mid-stream. After dinner guests can enjoy a Dance and Drama performance by the Mandalay Arts School on the sundeck (if available). Early in the morning cruise downstream. During the 2 hours journey the passengers can admire the natural beauty of the river and the life of its banks while relaxing on the sundeck or just sitting outside their own cabin. Enjoy the sunrise over Sagaing Hill. Visit Sagaing After breakfast passengers can go ashore to visit Sagaing with the assistance of our Ship Manager or their own guide. Downstream to Bagan The cast off time is at 10.30 hrs. Lunch will be served at 13.00. In the late afternoon we stop at Yandabo, a village specialize in Pot-Making, where the peace treaty of the First Anglo-Burmese war was signed on Feb. 24, 1826. Cruise all day and moor overnight near a river village. Moor overnight near the village of Shwe Nann Tint. In the afternoon, you will be able to soak up the atmosphere and sheer scale of the temples around Bagan. You will spend around four hours, soaking up the magic atmosphere of the area and taking in various temples, including the temples of Shwezigon, Gu Pyauk Gyi . The view across the temple complex of the ancient city of Bagan from Bu Lei Thee Pagoda. Once finished, you will be back to your hotel, Bagan Lodge and ending the tour. In the afternoon, we start our tour. Drive to Dammayan Gyi Temple. Largest in Bagan, huge pyramid temple. (1160’s) Manuhar Paya, home to 4 large and very claustrophobic Buddha statues said to represent the “captive” state of mind of king Manuha who was imprisoned in Bagan. Short walk to Nanpaya Temple. Hindu temple with great carvings of Brahma inside. After sunset visit Ananda at night. A beautiful and exclusive stop! One of the most beautiful temples, lit up at night, virtually no other tourists no vendors, just a few worshippers. Magically atmospheric. However, please note the temple close at 7PM and you will be transferred back to your hotel. Fly to Heho for 30 minute flight. Arrival at Heho airport and we transfer to your hotel. From Heho airport to Ayetharyar Golf Course for a round. Caddie are included. Later, we transfer to Nyaung Shwe jetty (30km=1hour), it is about one hour scenic drive to Nyaung Shwe located on the edge of Lake Inle. En-route when nearly enter Nyaung Shwe town, we will include visit Shwe Yan Pyay monastery. After that, the car will stop for a minute to buy Zone fees, and then, continue drive to Nyaung Shwe jetty. From Nyaung Shwe jetty, board on your private local boat and transfer to your hotel on the Lake.Accommodation at your hotel. After finished your breakfast, enjoy full day boat trip excursion on Inle Lake. A photographer’s dream, its calm waters are dotted with floating vegetation and fishing canoes, to which scenic high hills provide the perfect backdrop. Pass the endless of floating gardens, where fruit and vegetables are grown. A snarl of lake silt and weed produces, after about 50 years, a thick layer of humus that can then be turned into a floating vegetable or flower garden buoyant enough to support a human\’s weight for a brief time. The Inthas tend their lake gardens from long, banana-shaped boats, and row standing up, with one leg wrapped around the oar, leaving both hands free to fish or maneuver the nets. Continue your visit to Phaung Daw Oo Pagoda, the holiest religious site in southern Shan State. Lunch will enjoy at local restaurant (client own account). In the afternoon, explore traditional handicrafts – silk weaving on wooden handlooms near In Paw Khone and a blacksmith workshop. If time permits, stroll near a lakeside village to explore the lives of Intha. Based on weather permitting, sunset over the lake and we return to your hotel. Arrival at Yangon Domestic airport and transfer to hotel. Pick up from your Hotel and transfer to the golf course. Confirmed tee off for 1 round 18 holes. After golf, transfer back to the hotel. The tour begins this morning at Nanthida Jetty, close to the colonial elegance of the Strand Hotel. From here begin a leisurely-paced walking tour of the city, following the course of the Yangon River and heading first to the bustling harbour area, from where the ferries leave for the Delta region and the upcountry towns that lie along the Irrawaddy (Ayeyarwady) River. Yangon is blessed with the highest concentration of colonial architecture in Southeast Asia and the famous Pansodan Street features architectural interests such as the former High Court and General Telegraph Office. Also visit the Independence Monument and St Mary’s Cathedral, the largest in the country. If available, then take a rickshaw to the Botataung Pagoda. Continue down the Strand Road, taking an opportunity to soak up the hustle and bustle of downtown Yangon and its wonderful Victorian architecture. We will take you out for lunch at local restaurant for your final experiences. In the afternoon, you will visit to Chauk Htat Gyi Pagoda to see a huge reclining Buddha image. Finally, we ending our visit to Shwedagon Pagoda, famous worldwide – its golden stupa is the ‘heart’ of Buddhist Myanmar. The Pagoda is believed to be 2,500 years old and the central stupa in surrounded by dozens of intricately decorated buildings and statues. There are always many Myanmar people praying and making offerings at the Shwedagon, and it’s a fascinating place to spend time watching the world go by. Later, return to your hotel for accommodation. Breakfast at hotel and check-out. We transfer to airport for your flight home.